The City of Houston drainage fee ordinance enacted in 2011 was enacted to provide additional revenue to provide drainage infrastructure and drainage services to “benefitted properties” located within the City of Houston. This is on top of the property taxes every property owner pays to the City of Houston every year. There are many lots and parcels within the City of Houston that are not “benefitted properties”, because they receive their drainage services from a municipal utility district, the Harris County Flood Control District, Harris County, the Army Corp of Engineers, and the Port of Houston Authority. Even though those property owners are required to pay for drainage improvements within Houston with a portion of their property taxes to the City of Houston and the HCFCD, those properties should not be required to pay the additional drainage charges and fees if they cannot use or benefit from the service Houston is unable to or cannot provide. Houston cannot use this fee as a disguised additional tax on every property owner within the city. 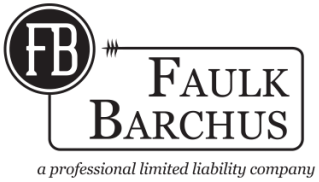 Faulk Barchus represents property owners in the Houston city limits who do not benefit from the city's drainage utility system, but rather drain into the bayous, or other facilities not owned or operated by Houston until it reaches the Gulf of Mexico. These property owners should NOT be assessed an additional drainage tax every month.